The crown of a tooth is the visible portion of the tooth above the gum line. When a tooth becomes damaged to such an extent that it is no longer prudent to keep it, a dental crown is often a fantastic option. Our dental crowns are made of the highest quality materials which perfectly resemble the beauty and strength of a natural tooth. Often a dental crown is placed on the natural tooth structure to ensure the healthiest and longest-lived smile possible. AESTHETICS | Dental technology has come a long way! The modern materials used to craft dental crowns resemble the natural sheen and translucency of a natural tooth. We can even match the color of the new dental crown to a degree which makes it nearly impossible to tell the difference between the crown and the natural tooth. FUNCTION | Not only will the crown look natural, but it will also perform and function just like your real teeth. You will be able to eat, chew, and smile without even noticing your dental crown. DURABILITY | We use impressively strong materials in our dental crowns. These materials enable the crown to last a long time and retain its natural look and functionality. A dental bridge is simply a sequence of dental crowns affixed to each other. Dental Bridges are intended to fill in a gap or space in a smile. Dental bridges are attached to adjacent teeth or dental implants and are a permanent solution for a missing tooth. 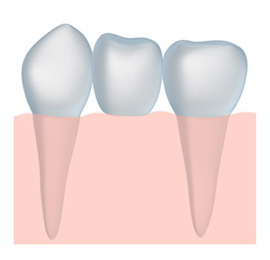 Similar materials are used to create a dental bridge as what is used for a dental crown. This means beauty, functionality, and durability. Schedule a visit today to find out if dental crowns or a dental bridge are the best solutions for you.